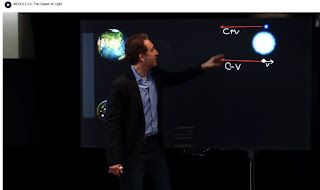 A couple years ago, I took a course titled Space, Time & Einstein at the WorldScienceU.com web site. 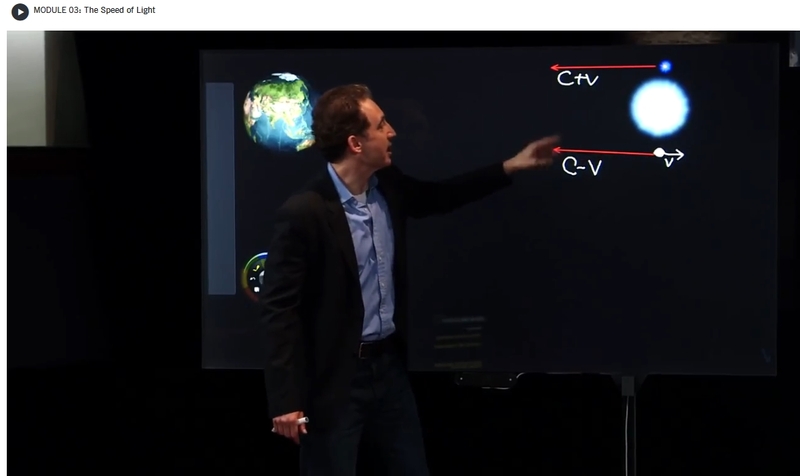 It's taught by Professor Brian Greene of Columbia University in New York City. There were things about the course that bothered me, and I started thinking about Time Dilation and how it really works. There was something in Professor Greene's lecture on "The Reality of Past, Present and Future" (Module #8) that bothered me a lot. But then I forgot all about it as I organized my thoughts and worked on my scientific papers on "Time Dilation Re-visualized" and "What is Time?" Then, while waiting to see if my newest paper on Time Dilated Light will be accepted by a peer reviewed journal, I decided to watch parts of Professor Greene's course over again. I want to make it clear before continuing that Professor Greene is not teaching anything that other physics professors aren't also teaching. The only difference is the Professor Greene's course and lectures are on-line where I can easily access them. I soon realized what bothered me about "Module #8" back then. Prof. Greene was breaking Time down into "quanta," i.e., into moments, like the individual frames of a movie. And he was viewing time as a mathematician would view time. Plus, the lecture concludes with Professor Greene saying that, "What this collectively tells us is that the traditional way we think about reality - the present is real, the past is gone, the future is yet to be - that is without any real basis in physics. What we are really learning from these ideas is that the past, the present and the future are all equally real." If you believe that, then you can also argue that everything we see may be equally unreal - from a mathematician's point of view. Looking over the course schedule, I noticed that Module #3 was titled "The Speed of Light." That's the subject of my latest scientific paper. So, I watched Module #3 again. Wow! It's total nonsense! Professor Greene explains that the fact that the velocity of the light-emitting-object (when it is coming toward you or going away from you) cannot be added to or subtracted from the speed of light you perceive is proof that the speed of light is a "universal constant." It proves no such thing! It is simply proof that the direction an object is moving does not affect the speed of light coming from the object. I couldn't remember any of that from when I took the course in early 2014. Evidently, it had no significance to me then. Now I see it is just plain WRONG. But there was even more nonsense to come. I then watched the lecture on "Time In Motion" (Module #5), which is about Time Dilation. 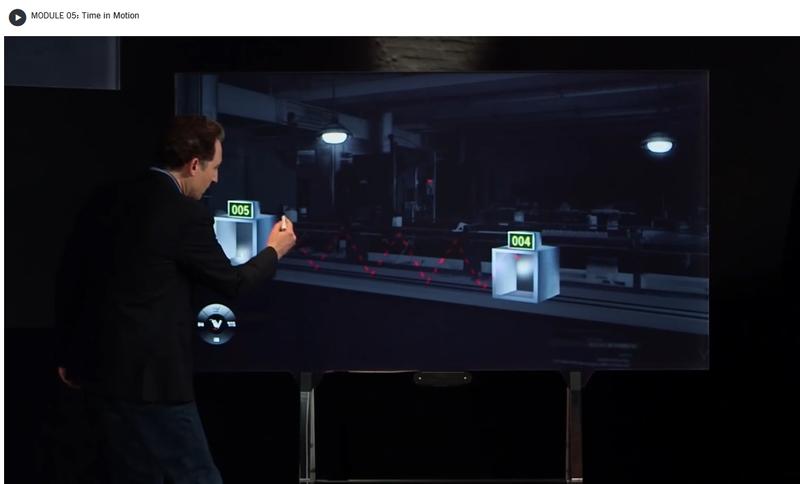 In the screen capture below, he is explaining how the stationary clock by his hand runs faster than the moving clock off to his right because light bounces off mirrors more slowly when the mirrors are moving while light is being used to measure time. That is total nonsense, and it is also a demonstration that has very little to do with Time Dilation or reality! He was teaching his students that Time Dilation is just "an optical illusion." He didn't use that term, of course. He was carefully explaining how a stationary person will view an object as moving while a moving person will view the stationary person as moving. Furthermore, it is a totally wrong and silly demonstration. It's twisting the facts to rationalize a belief! In reality, light would not bounce at angles between moving mirrors, light would move in a straight line and the mirrors would simply move out of the path of the bouncing light! Plus, if the speed of light is fixed and universal, a stationary light clock would give the same result on Earth as on Jupiter and in empty space, and it would disprove Einstein's theory of gravitational time dilation! It would have been better if Prof. Greene had used the explanation of how a ball is perceived to move if a child on a jet plane tosses it up and down as the plane moves at 500 miles per hour. The child will see the ball going straight up and straight down, while some imaginary viewer on the ground will see the ball travel in an arc that covers over a thousand feet laterally between the time the ball leaves the boy's hand and the time he catches it again. It really has nothing to do with Time Dilation, it only has to do with Relativity, and therefore it is the same as saying Time Dilation is just an optical illusion. That is where everyone goes wrong! They do not think of Time Dilation as a real phenomenon all by itself, they only think of it in terms of relativity! 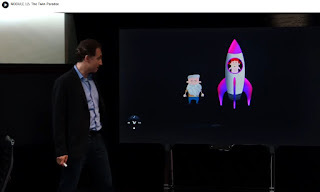 And, it was really bizarre when I watched Module #7, "Time Dilation - Experimental Evidence," in which Prof. Greene explains how Time Dilation has been confirmed by people carrying atomic clocks aboard airplanes, and he explained how muons exist longer when they are traveling faster. Professor Greene makes absolutely no mention of gravitational time dilation. Nor does he explain who was the "observer" when the atomic clocks were flown around the world. He doesn't put 2 and 2 together. Module #12 was the most absurd of all. It's titled "The Twin Paradox," and it shows how preposterous the explanations can get when mathematicians try to rationalize and distort Time Dilation to make it fit their equations. Prof. Greene uses "fraternal twins," George and Gracie. While George remains on Earth, Gracie goes off on a space ship to some nearby star and then returns. That's simple enough, but Prof. Greene then explains how neither twin knows who is really moving. He has Gracie arguing that her space ship is standing still while George and the planet Earth moved away from her, while George argues just the opposite. Prof. Greene then explains that George is right because Gracie felt acceleration, which wouldn't happen if she had been standing still. It's an absolutely silly explanation of Time Dilation. In what universe would a space traveler think that she was standing still while the planet she just rocketed away from must be moving away from her and then somehow it reversed course to come back to her once again? It's idiotic! It also shows how mathematicians do not care about logic or reasoning. They only care about how the math works. The math says that an astronaut can stand still while the Earth moves away from his rocket, therefore it must be possible. At several points in the course, Professor Greene pauses to explain to his students that if what he is saying doesn't seem to make any sense, then they should take the version of his course that focuses on mathematics. Yes, why not? After all, in the world of mathematics "garbage in, garbage out" is totally acceptable if the equation looks clever. Nothing needs to be logical or make sense if the mathematics work. Science today is about mathematics, not about logic -- or science. I not picking on Prof. Greene. He's just teaching the same nonsense that most physics professors seem to be teaching. As stated above, Prof. Greene merely put his course on the Internet where I could take it and view the lectures over again. I should be grateful. It taught me a great deal, but definitely not what Prof. Greene intended to teach. I don't see any way to contact Prof. Greene directly, so I posted a "zinger" question to the discussions for Module #5. Click HERE to see if you can view it. It works for me. There are probably many similar videos out there.